Old School sweet Raw Soul! Great station, great music...thanks for the tunes!!! WeFunk rocks!! thanks from belgium! wow - amazing archive und unbelievable mixes. grettings from germany! Big up WeFunk - my favourite radio station. Period. Great Radio Men !!! I love it... Thanks for Your work. Keep doin Yo thang !! Peace..
You guys played LA Symphony! Very very nice. The comment from Gretchen is right ! 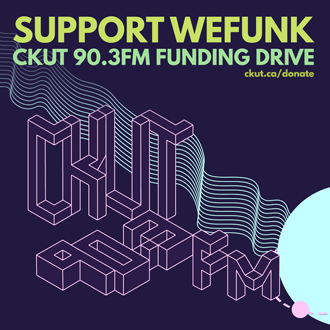 (1) I want/NEED your playlists (2) I want to buy more we-funk mixes (just sell me the shows) ! What the track artist and name for #193 ~20 minutes with the "100 hundred ways" sample in it? Heh, I love it when you get super funky! The first song of this show, "Let me be your love maker... etc.". Who's singing it? She's awesome! The playlists are a great thing, I highly encourage you putting them in as much as possible. I write CD wish lists by the dozen from your show. Thank You for your show!!! cann anyone please tell me the name of the tribe called quest track @ about 40:00 of part one? peace & blessings~ thanks again my friends! Bwoy! This is one killer show your droppin' right now! I'll be passing thru T-dot and elsewhere next year - make sure you keep it hot! UK Crew - hold tight! Missed most of the show but liked very much what I heard. I'm listening on Apple's iTunes and I'm lucky to have stumbled on your show. It was great actually. Even the funk that I heard at first which made me almost switch. Pays to be open-minded. Thanks for the show. DJs & GUESTS Professor Groove, Rawsoul / RECORDED July 20, 2001 / PLAYLIST MARKING sirbaihu / HOSTING PJ, Mike, Oliver & daduke. You can help too! This playlist is courtesy of the WEFUNK Playlist Project. Thanks to Johnathan James, Julian Taylor, Greg Rutter & Pablo for their work in putting this playlist together.